We’ve completed our first week, which means we’re about 16% done with the class. We learned about apostrophe usage (John’s going to bed [John is going to bed]; It is John’s bed [It is the bed of John]). We quickly discussed the writing process (pre-writing, drafting and editing). We started to examine the skill of summarizing information (remember, there is such a thing as saying too much and such a thing as saying too little). For homework, read this sample essay, taken from a CUNY CATW exam, and summarize it. You do NOT need to respond to the essay – simply restate, concisely and in your own words, what is being said. First, Spielberg is finally going to make his Abraham Lincoln movie, and none other than Daniel Day Lewis will be playing Lincoln. This pretty much ensures that the film will at least be watchable. Let the thing be pressed, indeed! I don’t mean to peg myself too much as a New York Times reader, but the Times has yet another article that relates to the Civil War, although it is not part of their Disunion series. Rather, it’s an article on the humanities in general and how certain individuals within academia are attempting to use more quantitative methods in the study of history and other liberal arts. Look at the bibliography of any major work on the Civil War, for instance, and you will likely be impressed by the extent of the resources used (unless you’re looking at Shelby Foote’s 3 volume look at the war between the states, which infamously did not cite sources or even list a bibliography). So excluding old Shelby, an historian may read or skim a vast array of resources. Still, scholars are generally human, and there is only so much material a man can read. Digital technology allows us to enter vast amounts of historical information into computers – letters, newspapers, books, census data, stock market data, in the case of the civil war, the greenback market, geographic information, audio and video more recently, etc. – which can then be analyzed in many different ways. Digging for Data is a project sponsored by several research agencies, including the National Endowment for the Humanities, which awards grants to scholars who will use data and digital technology to look at historical issues. One such recipient is looking at railroad construction and how it influenced strategy. Anyway, all of this is nice, and who doesn’t love a cool Google map? But we must ask how useful any of this is. We may also ask if analyzing documents and information and quantifying various qualitative artifacts may start to move us in the direction of reducing human experience to biological/chemical/physical laws. I’ve said before and I’ll say again, all of our explanations for human activity may be nonsense. Someday we may know that humans don’t really make decisions or that the Civil War happened for XYZ reasons but rather because of various quantum laws or because e=mc^2. In the NY Times’ ongoing series, Disunion, in which they track the progression of the war between the states, there is an interesting essay today on the tide of succession and those who may not have supported it but went along with it. There had always been tensions and divisions between the North and the South, but it took one event, the election of Abraham Lincoln, to tip the scales. It was almost as if once that happened, some sort of invisible gas was released into the air in the South, causing many to be cast under it’s spell. And even those who were initially immune found themselves giving in, despite their better judgment. I’ve started reading a classic Civil War study, Why the South Lost the Civil War. Note, dear reader, that the title is posed as a statement, as in, “this is why the South lost.” However, the authors would agree that the book is as much a study of what others have explained as the reason (or reasons) of why the South lost than it is the opinion of the authors of why the war ended as it did. So not just the authors of a silly Civil War book, but no less an authority than the mighty Walter Benjamin, believe there are answers to our questions, even if we don’t know them. Let us here bring up a useful distinction when it comes to studying the world. There are the issues of the hard sciences, and there are the issues of the social sciences. It is one thing to ask, “If you throw an object of these dimensions in such a space with these physical laws, when will it hit the ground?” and another thing to ask “Why did the South lose the Civil War?” (Please note, there are some who think the conception of “hard” sciences as rigid, logical, precise, and existing independent of ours minds is a cultural myth). Myth or not, there indeed seems like there is a difference between asking what the sum of two numbers is and why a war happened or why it was lost. Indeed, what could the answer to the question, Why Did the South Lose the War, even look like? Would it be a 5 paragraph essay? Would it be a list? Just what would have to be said to know with certainty why the war turned out the way it did? It seems like even if we could see the answer we wouldn’t know it. We assume, of course, that the answer would take some sort of form outlined in the title of this post, a form in which causal factors are set up, in which a chain of events occurs. Sometimes these types of chains seem relatively simple. For instance, let me describe a recent “incident” from my job. I work at a career services office at a university. We recently encouraged students to purchase business cards from the university printing services shop. They cost $50 for 250 cards. It was later brought to our attention that a certain office at the university was offering a deal to all students so that they could purchase 250 cards (still from the same printing services shop) for only $25. When we found out, we notified students that they could purchase cards at a discounted rate through this other office. There were several students who already purchased the cards for $50 and they were not happy. So let’s pose a question: Why were some university students unhappy about paying $50 for 250 business cards? The answer doesn’t seem too complicated, and the answer seems like common sense and indeed just plain right. Yet, again, how could any explanation of why the South lost the war ever seem so plain and so undoubtedly correct? Of course, we could get even more skeptical and question even the truth of the “simple” scenario in which a bunch of university students are pissed off about overpaying for business cards. For there are some who have said there is no such thing as knowledge of causes. We simply observe tendencies between two events occurring one after another. Imagine someone playing pool and hitting a cue ball into another ball, which then goes into the pocket. We would say the cue ball hitting the second ball caused it to slide into the pocket. Yet what is this word cause? Is it a distinct power or relationship in nature? Is it something that exists in the universe? Or is it just a word, an invisible cloud, that we use to reference how certain phenomena seem to appear one after the other in most cases? I suppose the short and easy way to sum all of this up is that there may be no way to state with certainty why the South lost the Civil War. Or perhaps there is, but it will take huge advances in our understanding of the universe, of the relationship between physical and psychological/social phenomenon, before such an answer can be formulated. I will close by paraphrasing a great philosopher. Imagine a stone falling through the air that all of a sudden can think and comes up with all sorts of answers about why it is falling at the speed and direction in which it’s falling. We would know (or would we?) that there were precise laws that determined the stone’s path, despite any of the stone’s cute imaginings. And so it may be with the Civil War. Discussion of lack of resources, poor leadership, lack of will, etc., may have nothing to do with why it really happened. Or at least not in the way we might imagine. Yes, my friends, perhaps the Civil War was just a stone falling from the sky. One of the great questions for historians, referenced above, may be stated as follows: are we active agents or unwitting pawns? This question is interesting not only in a larger historical sense but also in the realm of mundane personal events. Yet even though the full extent of our personalities may be shrouded in mystery, Fuller, whose book was published in 1957, assumes that men do indeed impact history. In particular, a few great men have the ability to escape this dungeon and in doing so have an even larger and more calibrated effect on history. Robert E. Lee and Ulysses S. Grant are two men widely accepted to have been extremely influential in the conduct and outcome of the American Civil War. 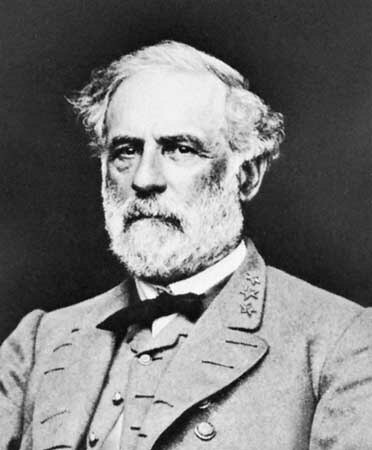 To many, if not all, Robert E. Lee encapsulates the Confederacy more than any other man. This came to be the case during the war itself, and remains so today in the popular imagination. The same cannot necessarily be said of Ulysses S. Grant and the North. It is much more likely that Lincoln would be considered the human symbol of the Union. Lincoln, of course, attained this status after his assassination; Lee rose to god-like stature during his lifetime and during the war. Based on the little I know of Lee, he seems much less interesting than many other Civil War commanders. As Fuller says himself, “as an individual apart from the war there is nothing remarkable in Lee’s character and personality, except that he was pre-eminently a good man.” Yes, of course Lee is interesting because he was the commander of the Army of Northern Virginia, but there does not seem to be much else about him that is interesting. Based partly on Fuller’s re-assessment, though, Grant has since become counted at the very least as a truly great general, if not a truly great and perhaps brilliant man. Grant, to me, is instantly more likable and interesting than Lee. A no-nonsense, extremely practical man who, unlike Lee, hadn’t amounted to anything before the war, but through the crucible of battle rose to great heights. 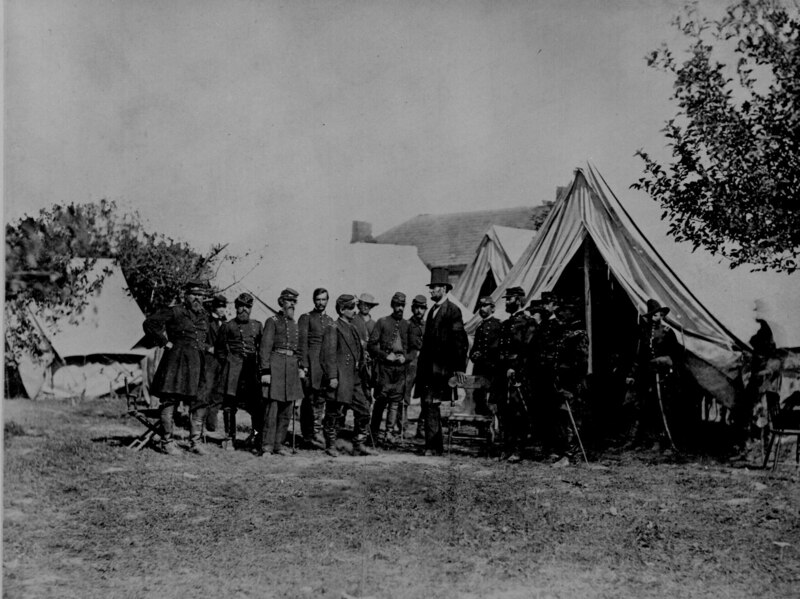 When I think of Grant I imagine him standing outside in the rain during the Wilderness Campaign, wearing his plain soldier’s uniform with nothing to demonstrate his rank other than his stars sewn on his private’s jacket, smoking a cigar and perhaps eating a cucumber soaked in vinegar, which was his breakfast of choice. I think of someone quiet who thought about the problem at hand and then made decisions and quickly and clearly and concisely gave orders without much fanfare. 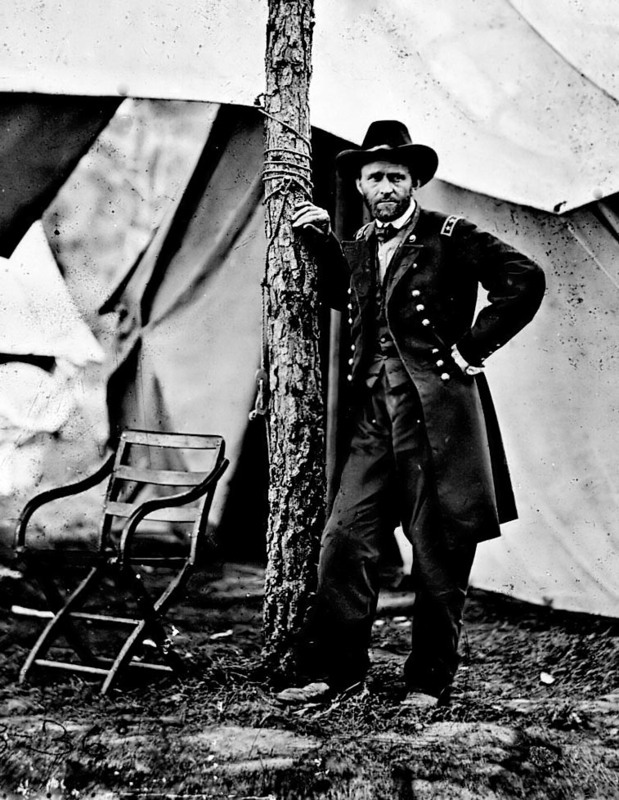 Fullers writes that Grant, “throughout his life never failed to look at every problem from the simplest point of view, to answer it in the simplest possible manner.” As an example from before the war, Ulysses S. Grant was actually born Hiram Ulysses Grant. He ended up not liking the name, though, because the initials spelled “HUG,” and he was concerned he would be teased at West Point. He therefore exchanged the places of Hiram and Ulysses in his name to avoid that problem, coming up with Ulysses H. Grant. Upon arriving at West Point to begin his military education, the paperwork had become fouled up and West Point only had a record for a new student named Ulysses Simpson Grant. Rather than have his paperwork sent back to Washington to be sorted out, thus delaying his matriculation, Grant simply decided to take on the name Ulysses Simpson and went by it for the remainder of his life. I do not mean to make Grant out to be simple-minded because he was simple. In fact, it takes a certain type of genius and restraint to see things at their most basic. Much has been made of Grant’s lack of achievement before the war. This could indeed be interpreted as a flaw, and perhaps it was. Yet there is something interesting to me in that Grant’s true greatness was not exposed until a great event unfolded in which he could take part. It has been suggested that Grant was bored with “ordinary” life and didn’t see much of a reason to do much when things were going smoothly. Two men. Lee, the spiritual father of the Lost Cause, the commander of an army of rugged soldiers on a holy quest to create a Kingdom of Heaven on Earth. Grant, the determined and administratively capable leader of a modern civilian army raised with the purpose of sustaining a Republic which stressed the moral and social benefits of personal liberty, free markets, and industrialization. It is quite easy to make symbols of these human beings. But then at that point, we are on the road to limiting the role of personality. Personality simply becomes symbolic and does not include a view of free will in which we consciously make choices to manipulate the world around us. Rather, it is the world itself that manipulates us into carrying out events. I am personally open to the idea that everything we think and feel is but a mist that arises out of the condensation of historical or physical forces. Much like steam is released from a steam-engine and is simply a by-product and has no effect on the function of the engine, perhaps our personalities and “choices” are the same, from the individual level of personal, domestic relationships, up to the level of generals commanding armies. It is rather difficult to imagine us getting much pleasure from analyzing the Civil War from the sub-atomic perspective, although perhaps that’s a topic for another post. The title of this, the first post of A Stillness on the Internet, is taken from the introduction of a James McPherson book, Writing the Civil War. For any Civil War enthusiast, the words take on an instant meaning. For someone not as interested, the question might arise: what are they talking about? What participants? What quest? The participants are sometimes known as Civil War buffs. It is a fair question to ask why there is such a thing as a Civil War “buff.” Why would someone spend so much time reading about an event that took place long ago? Why would someone dress up in a costume and march around? (In all fairness to myself, I do not dress up in costumes, at least not anymore, but to each his or her own). Some historians of the Civil War have claimed that to understand the United States you must understand the Civil War. Historians in general will often tell you that history helps us to understand who we are in the present, in an emotional/psychological sense, and in a broader way related to how our social institutions are structured and how they function. They will also tell you that history has practical applications, perhaps reciting the dictum “those who don’t know history are doomed to repeat it.” In regards to the former sense of self-understanding, fine. In regards to the latter sense of practicality, I’m not so sure. At any rate, it must be noted that people who often claim how important the Civil War is/was are people who have spent large chunks of their lives studying it. It seems unlikely, then, that they would concede that the whole thing is meaningless. I, on the other hand, am perfectly willing to concede it’s meaningless. But that doesn’t mean I don’t find it fascinating. Delving into the Civil War is in some ways like delving into any subject: it’s an entire world, an entire universe, and the more immersed you become, the more complexity (and simplicity) you uncover. The more you learn about one thing, the more you are required to learn about a thousand other related things. At the same time you see very basic human emotions at play that we all experience and that continue to muddle our relationships with others on an individual level and much larger social and political levels. Back to the Civil War, though, it is incredible (to me) to learn what the individual players knew, why they made the decisions they made, and how these decisions impacted the finished product. Or, you can ponder if individuals played much of a role at all. Perhaps the whole thing was a mishmash of impersonal, historical forces. And then you can ponder if indeed anyone on this planet has free will and can make rational decisions, or if it only seems that way. I’ve had an interest in the Civil War since I was around 12. My interest has grown exponentially in the past year or so. I now have a college education, for what that’s worth, and happened to major in a humanities-related field. So while I now bring a formal education to the table, and my skills and tools are more advanced than they were when I was 12, the whole emotional motivation is really the same. The Civil War is a story, a drama that allows me to learn about interesting characters and events, that allows me to picture an idealized version of the world. It might seem strange to conceive of a war as an idealized version of the world. But indeed, there is something about the Civil War that seems pure and genuine. I can imagine that these men believed deeply in what they were doing and were making every attempt to create a society that they believed was righteous and just. For the record, I might as well state that of course I do not believe slavery is acceptable and therefore it’s rather dubious to say that Southerners were in any way participating in a just cause, yet I can also acknowledge that I do not hold any monopoly on righteousness and it’s more interesting to try and understand why slavery could be seen as acceptable than to quickly pass judgment and move on. Indeed, if there is any truth to knowing history so that it won’t be repeated, we must take the approach of trying to understand rather than becoming emotional – nothing is gained from that. So yes, I look at the Civil War and at least pretend that great men were involved and that something important was really happening, something with cosmic implications. If in reality I don’t feel that way about my own life or the current age or if, deep down, I know the Civil War was no different, I can at least imagine that something truly meaningful happened here from 1861-1865. Therefore, for me, the Civil War is really about my quest for meaning. Yet I also accept that “meaning” may be nothing more than entertainment, enjoying yourself while you are here on this planet, and nothing more. But it is nice to hope that there is more.